They changed the boating rules to require people in reverse age (i.e. youngest to oldest) to have a license to prove they know the rules of boating. I found it rather amusing, as many of my questions related to towing a boat or sewage disposal- both of which I consider pretty obvious, but maybe it isn't? I would be more concerned with whether or not people can dock a boat, personally (something I avoid doing on larger boats, even with bow thrusters and video of what you are backing in to...I mean...docking against.). 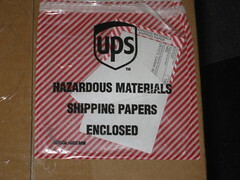 Ok, you are proably as confused why I am getting mail with "Hazardous Materials" papers stuck to the outside (which incidentally, wasn't allowed in a plane, it has to go via ground). I wasn't expecting the package, as it was early. My soda machine has arrived! Complete with two giant (16 inch tall) CO2 canisters, which apparently make it dangerous to transport. I don't actually drink much pop (in fact, I drink diet 7up and diet pepsi, and that is really about all I will go to any effort to seek out). I do however have a fondness for fizzy water and dry soda. The slightly sweet, naturally flovered, herbal undertones do me in. Not don't get me wrong- I crave a Coke or Root Beer now and again. But on the day to day, I just want fizzy water. Seattle water is good, but tastes like chlorine to me, and is well, boring. However, I hate paying for pop in cans I then have to recycle (and worse, lug back from somewhere) or expensive albeit very tasty dry sodas. I refuse to by actual fizzy water most of the time since it always seems silly to by water I could carbonate myself with a CO2 cartidge. I just never got around to bringing one of the siphons down. I have to say...I am impressed! I was dubious at first, as the pieces are plastic (the bottles are PET plastic, which I am not concerned about as they are not going in the dishwasher or other high heat), but it seems sturdy enough when all is in place. I like that the cartridges are giant (about 100 1 liters/cartridge) and returnable. 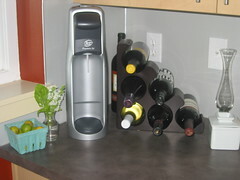 Plus, I can have multiple types of soda/juice/flavored water in my house at once. I immediately sat down and made lime soda with a mixer I had in the fridge, lavender soda (my all time fav flavor) with a simple syrup, plain fizzy water, and tried once of their soda mixes, which tasted a lot like Dr. Pepper. Good thing it was hot out today, as I have already had almost 2 liters! Want to make your own soda but have no carbonation? Do you have yeast? Then you can make soda. That site also has some good cheese recipes- try making panner/panir if you never have before. I found a really nice low key coffee shop to sit in for awhile today. Most are Starbucks around here, which I don't actually really mind, but they aren't places I can sit to just work or read for awhile. The place reminded me a lot of a coffee shop in Austin, TX that I used to hang out in a lot, and actually made a decent iced Americano. Unpretentious, with low key (thrifted?) seating, perfect for reading my new library books.